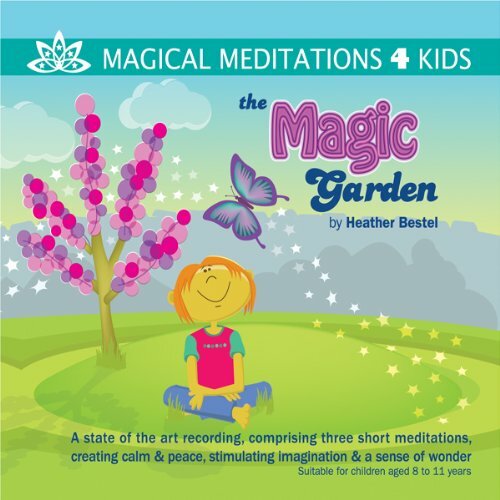 The Magic Garden is a superb high quality meditation recording by Heather Bestel. Heather is a very experienced psychotherapist who has worked with children developing and building their self esteem and confidence since 1994. This audio is a lovely and safe way for 8 to 11 year old children. They will love visiting their own special quiet place where they can develop a sense of wonder and feel: calm & peaceful, happy & relaxed, safe & loved. With the use of this audio, Children learn to develop their own inner resources to cope with the big, wide world. 3 Floating down the River. ‘The Magic Garden’ is ideal for using at home: during chill out time, at bedtime, on long journeys, before exams or anytime children need to switch off and relax. For use in school: at the beginning or end of each class, in the chill out zone, and during circle time. Each audio also includes instructions for a creative activity linked to the download content. For ‘The Magic Garden’ the activity includes making your own worry tree. This activity develops a strategy to dispel worry and apprehension. Would you listen to The Magic Garden again? Why? I'm a class teacher and play this to my children after break. They absolutely loved it because it was just the right length of time for them to really get into the story and use their imagination. They loved the Willow Tree meditation. That's all we' ve done so far. Recommended for use by school teacher's to create a calm learning environment and is accessible to almost all children.